No athlete in history has ever captivated audiences like Michael Jordan. He took pro basketball on his broad shoulders in the 1990s, winning six NBA championships between 1991 and 1998 with the Chicago Bulls while executing gravity defying dunks that are the stuff of legend. He retired as a player in 2003, but his star power has not waned—he’s the top-ranked athlete in history by The Harris Poll, ahead of such luminaries as Babe Ruth and Muhammad Ali. In his new life as a businessman Jordan has made one shrewd move after another. His Jordan Brand from Nike brings in more than $3 billion in annual sales worldwide, he owns a chain of steak houses and a car dealership, and he endorses a wide range of famous brands, from Gatorade sports drinks to Hanes undergarments and Upper Deck sports memorabilia. As the owner of the Charlotte Hornets he is the only former NBA player to also be a majority team owner. But he’s not stopping there. He recently joined with longtime friend and former Yankee great Derek Jeter, along with other investors, in a deal to acquire the Miami Marlins, and he will soon break ground on his own private golf club in Florida. His personal fortune has been estimated at more than $1 billion. Jordan is an intensely private man who gives few interviews. This summer he sat down at The Bear’s Club in Jupiter, Florida, with Cigar Aficionado editor and publisher Marvin R. Shanken for a second interview with the magazine (the first was in 2005) about his new life as a businessman, his thoughts about the state of sports, his longtime love of cigars and golf and much more. As the conversation began, Jordan was smoking a cigar. Marvin Shanken: You can put that cigar down. Michael Jordan: Put it down? You’ve got something else worthwhile? Shanken: From ’93. And whatever we don’t smoke [gestures to the box of Hoyos] is yours. Part of this gift is to bring back memories. Twenty, 30 years ago, millions of kids growing up wanted to be “like Mike,” as the slogan goes. When you were growing up, who did you look up to? Who did you want to be? Jordan: I wasn’t really into professional sports, because where I grew up [in Wilmington, North Carolina] you only had two television stations, NBC and ABC, and we couldn’t even get NBA games. So most of my focus stayed on the college game. I watched college basketball and baseball. My father was a big baseball fan; he loved Roberto Clemente. I grew up emulating his footsteps. Who he admired is who I watched. I also grew up a NASCAR fan, a Richard Petty fan. I was more into stock-car racing than I was into anything else. Shanken: In late 2015, The Harris Poll surveyed Americans to rank the most popular athletes in history. You were voted No. 1, Babe Ruth was No. 2, Muhammad Ali was No. 3. All this is wonderful. In your life, what is your greatest regret? Jordan: I really don’t have regrets. Shanken: What about your biggest disappointment? Jordan: Once again, that’s the same analogy. To win you have to lose. To be successful you have to have something that’s not successful. To be happy, you have to have disappointment. I understand the benefits and the privileges I have for being who I am. That’s one thing my parents taught me very well. Don’t rub success in people’s faces. So when you sit there and you say I was voted the most popular athlete, it’s ironic that I’m the youngest of the three. So in essence it’s all related to who is watching now. If you ask 20 years from now, I’m pretty sure LeBron [James] may beat me. If you ask me, I can never give you an opinion about things like that. As an athlete, all you ever want to do is be the best athlete that you can. Shanken: I have this burning question that I think you’re in a very unique position to answer. College kids can’t wait to leave school to go into the pros. At age 19, when you’re still a very young man, you give up your education, you give up the college experience and so forth. Upon reflection, what do you think is really the correct way—the right way—for the NBA to handle this? Jordan: I’ve been on both sides. I left school at the age of 20, 21, in my junior season. It was a business decision, an opportunity for me to play professional basketball. If a kid wants to go and work and play professional sports and earn a living, he should be allowed to. Shanken: So what’s in the young man’s head? Is it about getting the best deal he can? Is it playing in a certain city? Jordan: Well, I think that’s a little bit hard to determine. You want to be able to have competitive balance within the league, and if a player or individual can choose to go to whatever respective team he wants, you’re going to have discrepancy in terms of the talent pool. If everyone wants to go to Chicago—you only can have 12 jobs in Chicago—Chicago is going to get all the best players. What about Dallas? What about Washington? What about these other cities? You’re starting to see a little bit of it now, where the stars are starting to gang up and go on one team. I think it’s going to hurt the overall aspect of the league from a competitive standpoint. You’re going to have one or two teams that are going to be great, and another 28 teams that are going to be garbage. Or they’re going to have a tough time surviving in the business environment. Shanken: So what role, positive or negative, does an agent play in helping the young man make the best decisions? And I ask you that because you not only were a player, but you’re an owner. Jordan: I think the agent’s responsibility is to educate the individuals. Educate the kids to be able to make sound decisions, from where they sit. A lot of times you have the agents making decisions based upon what they want, and sometimes it’s not in the best interests of the players. And I think if you can regulate that—which is very tough—to where that athlete’s going to be educated so that he can make sound decisions for himself and his family, that’s the correct agenda. I was in college for three years. Coach Smith, my parents, taught me right from wrong, taught me to understand and listen and learn, and then I got with an agent who educated me. Now I can do a lot of those things on my own. It’s an education. I think that can be very helpful for the kids today. But because an agent is not that motivated, they’re not teaching the kids. These kids mismanage their money and they may end up broke. Especially when you talk about the kids skipping college and going to the pros. Where are they going to get that education? The best support system is their agent. I think that’s one of the major issues. You see a lot of players who, when they retire, they have no money. Jordan: In all sports. It’s not just in basketball. Shanken: I assume you’re at a competitive disadvantage in a lot of ways. Also the audiences who watch basketball are declining—I think it peaked when you were playing. Some people say there are just too many teams, and the talent pool is diluted, and the economics favor big cities in many ways. I’m sure you didn’t buy the Charlotte team to be an also-ran. You want to win the big prize. Do you have a shot? How can you develop your team to become a winner? Jordan: It takes a lot of work, which I’m not afraid of. It takes a lot of forward thinking. Seeing good talent. Nurturing new talent, developing new talent. One of the biggest issues we do have is we are not a Chicago, we are not an L.A., we are not a big market to where teams or players look to go. So you have to create a winning culture, and you have to connect that basketball team to the support system within the community. One of the biggest reasons I bought the team is that initially I thought the team was under-operated because they were not connected to the community. Charlotte led the league in attendance for 10 years, which was a huge economic boon for that city, and the talent pool followed. They had good teams that went to the Eastern conference finals, they won 50 games. They had potential, and it got lost. When Charlotte moved to New Orleans, Charlotte was without a team. Then you had an owner come in who was not from North Carolina—and we’re good friends, Bob Johnson and I—that disconnected itself from the community, angered the community, to where they would not support it. The talent pool was not quite the same. The kids were getting younger and younger in drafts, and you didn’t have the same talent. When we played, the talent pool was much broader, because the kids were in college much longer. So as more players started to forgo college and go to the NBA, the talent pool eroded as well as the education of basketball. The star players are not rushing to small markets, so I put more emphasis on draft than I used to, because you’re not going to be able to get the LeBrons of the world to come to Charlotte. Shanken: When you were playing for the Bulls, I’m sure it was not on your mind to one day own a team. What motivated you to own a team? No player had ever done that before. Jordan: I always wanted to be connected to basketball, because of my love for the game. And the best way that I think I can pass on my knowledge to tomorrow’s players is through ownership. Initially, when I got out of basketball, I really didn’t know what I was going to do in terms of ownership. I was presented an opportunity in Washington, from a general manager’s standpoint. Ted Leonsis brought me in as part of his group. That’s where I got my feet wet in terms of ownership. Being able to transition from a basketball player who can impact a game, and determining outcome, to where you now sit up in an office without the same control, you have to be able to live vicariously through the players you select. And that’s what I learned in Washington. My first couple of years I was the general manager, and the next couple of years I went down and I played, because I still felt I could impact the game from a player’s standpoint. Not with the same magnitude as in Chicago, but from a teaching standpoint. A lot of these kids believe in leadership from a physical sense. I can show you how much hard work it takes. Shanken: What I’m hearing you say is your first and greatest passion is basketball. Jordan: Yes. At that time. Yes. Shanken: Now we’re fast forwarding all these years to today, and you are a very complete businessman, with many different interests. Do you have a favorite? Do you spend more time in one business than another? Your Jordan shoe brand from Nike, I am told, does $3 billion a year. That ain’t hay. Jordan: [laughs] But it was a process with that as well. It’s dots being connected. If you look at my portfolio, my strongest passion outside of the ownership of the Hornets is the Jordan Brand. It’s not where I’m dependent on how the season ends, to determine if I have a draft pick in the first 12 or 13 picks. The Jordan Brand is my DNA. It is who I am. The Hornets are a product of the personnel that I assemble. It’s a work in progress with the Hornets. With the Jordan Brand, it is successful because I can impact it. Shanken: I understand you also have a car dealership, Michael Jordan Nissan in Durham, North Carolina. Jordan: It was an opportunity presented to me early on, from a friend of mine in Wilmington, North Carolina. He owned car dealerships and he came to me and he said I have this opportunity—would you have an interest? Shanken: What about the Michael Jordan steak house restaurants? Shanken: But recently you’ve been expanding—why? Jordan: Because of their success. The Cornerstone guys, who I partner up with, manage the restaurants. What we have been able to do is understand what works with the consumer, and we’ve been able to grow that business. When I was in the NBA early on, would I have said I’d be a restaurant owner? No. Once that was presented to me, and I understood the dynamics of that business, we were able to grow that—utilizing my persona in a whole different way. Shanken: Was there something about being in the restaurant business that interested you personally? Jordan: I love food. I love gatherings. Plus, having somewhere to go where I can control the environment is intriguing for me. Because I can let my hair down—what little hair I have—and be able to do the things I want to do. My restaurants allow me to do that. I can go in, I can get a good meal, I can bring friends, I can talk, I can drink, I can do whatever I choose to do. It’s a safe haven for me, and yet at the same time it’s a great business. Shanken: And I assume you have no trouble getting a table. Jordan: No. Not that I know of. Shanken: We talked, 12 years ago, about your love of cigars, and you also said you enjoyed wine. You sell wine in your restaurants. At home, are you a drinker or are you a collector? Jordan: I’m a drinker. I do collect but I don’t believe in collecting and not being able to enjoy. Shanken: What kind of wines do you drink at home? Jordan: I’m into Burgundies, Pinots right now. And I got the education in wine from Bill Terlato [CEO of Terlato Wines International], who is a good friend of mine. We spend time talking about it. At one point we were thinking about doing a wine together, but I never got to a point where I could devote the time. Because you can always put your name on something, but most of the things that I do—practically all the things that I do—are very authentic in terms of my involvement. I don’t want to just lend my name to a product. Because at the end of the day, that product is always going to represent my DNA. So I like to have some interest, I like to have some input, I like to have some participation. There’s nothing that goes out with my name on it that we don’t oversee, we don’t deal with. Shanken: It seems like every time I’m at The Bear’s Club I see you out there wheeling around in your golf cart with a cigar in your mouth. 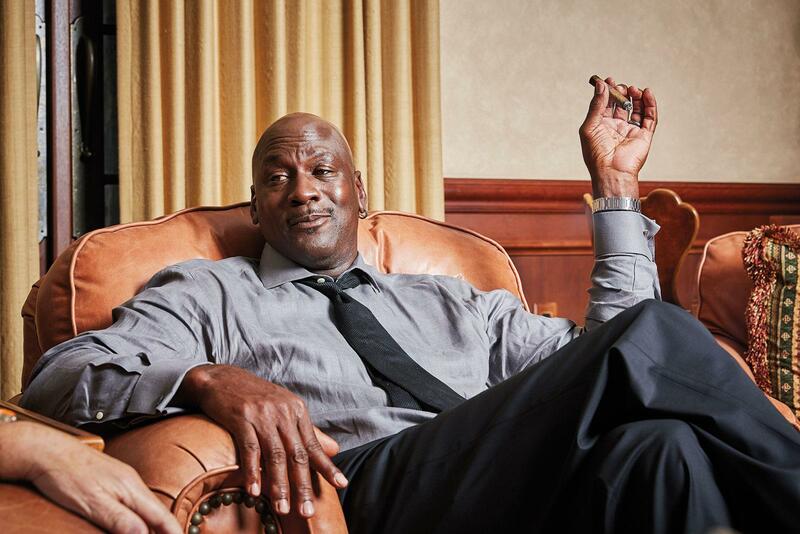 Jordan: I smoke six cigars a day maybe. Shanken: Do you play golf almost every day? Shanken: And what’s your handicap these days? Jordan: Four. And it’s a bad four. So don’t think you can take advantage. Shanken: I heard it was a two. Jordan: No, it’s a four. Shanken: I’m dying to know, have you had any holes in one? Jordan: At Turnberry in Miami. On No. 3, and No. 7. One I hit a seven iron, and one I hit a five wood. I’ve only had two. But it’s enough to keep me coming back. Shanken: You’re friends with a lot of young pros. I’m going to mention a few, and I’d like you to give me an idea of who they are and what you think their potential is. Let’s start with a new neighbor. Rory. Jordan: Very talented. Never played golf with him yet. I’ve seen him on the range: I’m a big fan. For someone that small to generate that much power? I’m massive, and some of these guys are so small, and they can blow it past me. Which is somewhat frustrating. Jordan: Rickie is coming into his own. Real talented. He is a phenomenon. He resonates with the consumer and the kids. Shanken: Have you ever played with Jordan Spieth? Jordan: I did about four weeks ago, in Cabo. Great kid. Very polite, very talented. Grinder. If you’ve got a guy that has heart, that has determination, he finds a will to win. That’s Jordan. He doesn’t hit it long. He’s a great putter. He’s got a lot of attributes and a lot of it comes from just his hard work. I don’t know if I could survive in this Twitter time. Where you don’t have the privacy that you would want, and what seems to be very innocent can always be misinterpreted. Jordan: Talented. I met him when he was 12 years old. Shanken: Do you play with any of these guys? Jordan: I play with them all here. I do all I can to get their competitive nature. Shanken: I know that you have, over the years, been very close with Tiger. Where do you see him today in terms of his life? Jordan: He’s in a transitional period. We athletes, we go through that. Then we have to be adults. We have to make sound decisions, we have to make quality decisions. He is, to me, in a very unique situation. Tiger played at his peak somewhere towards the end of my career. What changed between that time frame to now? Social media, Twitter, all types of things that have invaded the personal time of individuals. I don’t know if I could survive in this Twitter time. Where you don’t have the privacy that you would want, and what seems to be very innocent can always be misinterpreted. Shanken: Five, 10 years ago people were always asking who is greater, who is going to be the greatest, Tiger or Jack? I think that conversation is pretty much over to most people now. Jordan: I beg to differ. First of all you’re never going to say who is the greatest of all time. To me, that’s more for PR and selling stories and getting hype. Jack and Tiger never played against each other, they never played in the same tournament, they never played with the same equipment, they never played the same length of golf course. I never played against Wilt Chamberlain, I never played against Jerry West. To now say that one’s greater than the other is being a little bit unfair. How much impact did each change or evolve the game, Jack during his time when he played or Tiger during his time? Obviously Jack won more during the time he played. Tiger evolved the game to where it crossed a lot of different boundaries, where it was no longer just a white guy’s sport. And that grew the game from a financial standpoint. Now does that constitute him being the greatest? Does that mean he’s any less than Jack? I think it’s unfair. 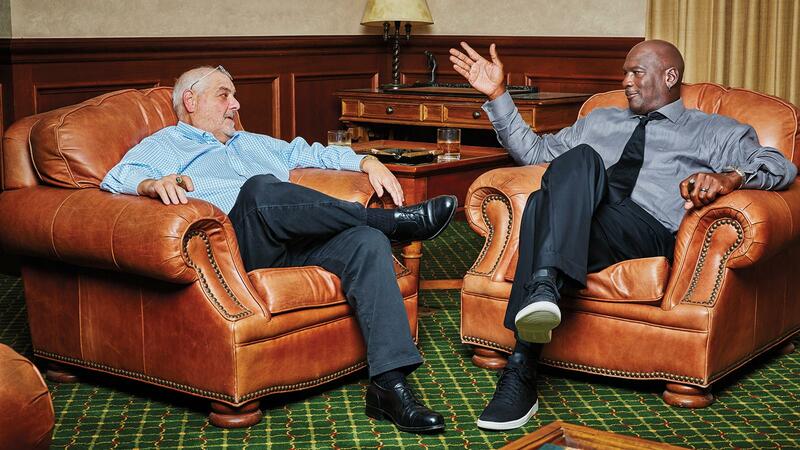 Yes, Jack has 18 majors and Tiger has 14. I won six championships. Bill Russell won 11. Does that make Bill Russell better than me or make me better than him? No, because we played in different eras. So when you’re trying to equate who is the greatest of all time, it’s an unfair parallel, it’s an unfair choice. Shanken: I’ve heard that you are creating a private golf course in Florida. Can you tell me what you’re doing? Jordan: Once I got involved in golf, I always wanted to own my own golf course. Never thought it would come to fruition. It’s not about housing, it’s not a pool, it’s strictly golf. And golf with very limited rules. I don’t like rules. If you want to play a fivesome, you play a fivesome, if you want to drive close to the green, but not on the green, you can do that. If you want to play music, play music. Very contemporary. We found some land. Right now we’re just going through the permit stage. Jordan: It’s about 20 minutes off of 95 [in Hobe Sound, Florida]. I bought about 287 acres and we’re building 18 holes, a teaching facility. Somewhere down the road hopefully we can do some cottages if we choose to do that. Shanken: Who is going to design the course? Jordan: Bobby Weed. He’s about my age, very creative mind, great conversations, great vision, and we’ve had countless dialogues about building a fun, links-type golf course similar to Erin Hills. Shanken: You have played at hundreds of different golf courses—which are your favorites? Jordan: It’s hard to say. I love Medinah, because of the historic aspect and being in Chicago. Augusta, without a doubt. Pebble Beach because of the scenery, but I hate the long rounds. Diamond Creek, right outside of Asheville, North Carolina. If I had to pick a golf course that I could play every single day and have a chance of shooting a decent number in the best conditions, I would say Diamond Creek would be one. I play from the backs. If I play from the backs I can have fun. Jordan: I’ve played in Scotland. Royal County Downs [in Ireland] I love. Druids Glen in Ireland. They’re supposed to be the Augusta National of Ireland. Shanken: Let’s talk about Derek Jeter. Jordan: He’s like my little brother. We hang out a lot. Shanken: And then a few weeks ago I saw your name mentioned as an investor in the Miami Marlins with Jeter. What motivated that? Was it strictly friendship or business? Jordan: Both. I love baseball. And it’s not final, they have to go through the approval state of his ownership. And when he came to me about getting involved I said “I’ll support you in whatever way.” I think he’s motivated to build a baseball franchise that can be successful. That is who he is. That’s the way he’s lived his life. Everything that I’ve tried to do from a basketball standpoint, he’s trying to do from a baseball standpoint. I think he’s going to do a great job. I think he’s going to roll up his sleeves, he’s going to dive in, he’s going to try to do the best he can in terms of reconnecting it back to the city of Miami. I don’t know how I can be a part of it, but I am a part of it from afar and from a support standpoint. But I love the game of baseball. Shanken: In some ways you are now on almost identical paths, as owners with a team that needs to step up its game. Shanken: You talk about teaching. Have you ever been a coach? Shanken: Did you ever want to be a coach? Jordan: No. I have no patience for coaching. My biggest problem from a competitive standpoint is the focus of today’s athlete. For me to ask an individual to focus on the game the way I played would, in some ways, be unfair. And if he didn’t do it, there’s no telling where my emotions would be. I don’t think I would have the patience for it. Coaching is not something I ever thought I could do from an emotional standpoint, because I have a different perception than the kids of today. Shanken: You said you smoke six cigars a day. What do you like to smoke? Jordan: Partagás Lusitanias are my favorite. Shanken: So you like a big cigar. 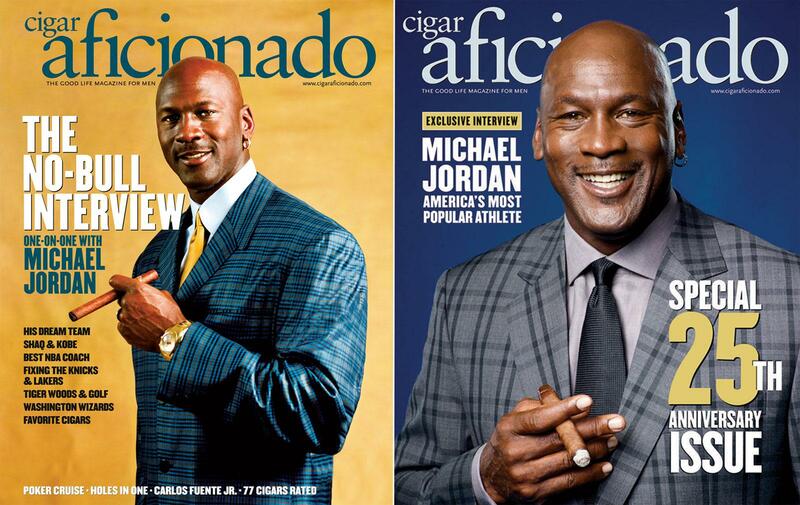 Jordan: I like a big cigar, but I can smoke a smaller cigar, too. I like variety. I like to experiment on different levels of cigars. Jordan: [Holding the Hoyo.] I’m not giving this up. Jordan: I was hoping you’d forget. So there’s more for me. Jordan: Have you ever been to Cuba? Shanken: Yes. Many times. Actually, I started going there in 1991 to do a cover story for The Wine Spectator on Cuban cigars. I had no idea when I went there I was going to create a cigar magazine. After I went to Cuba I decided I didn’t want to die without having a cigar magazine. Jordan: That’s my dream trip. Shanken: Well, you can go now. Jordan: I could. I want to go with no restraints. If I go right now, you still have restraints, politically as well as a lot of other things. My wife is Cuban. Her family has a lot of memories about Cuba, so in essence she wants to go, which I think is a motivational factor. She wants to go for different reasons. I want to go for particular reasons, obviously. In terms of us being able to go, it’s coming. It’s just a matter of time. Shanken: You would be so unbelievably welcomed in Cuba by the Cuban people and the Cuban government. It would have an enormous impact on how they felt about their own self-esteem. Jordan: I never looked at it that way. I looked at it from a selfish standpoint. I think it’s a very rich country in terms of heritage. I wish I could buy one of those old cars and ship it over here. I talk to my father-in-law about that all the time. I also want to go because I’m such a fan of cigars. Shanken: Well, if you went into a cigar factory all the cigar rollers would stop their work and they would give you a welcome that would give you goose bumps. Jordan: But I don’t want them to stop, I want to see what they do. Shanken: Well don’t worry, they will continue rolling cigars after the welcome. 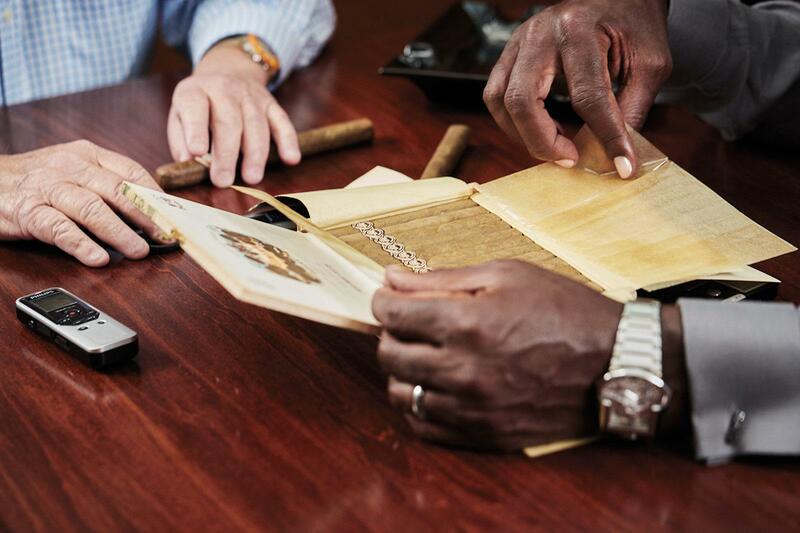 Have you been to a cigar factory anywhere else? Shanken: Let me ask you about a film project. What is this eight- or 10-part documentary? Jordan: [laughs] You’re very knowledgeable about things you’re not supposed to be knowledgeable about. Our last year [with the Bulls] in 1998, we had a camera crew following us for the whole time, to capture the last dance. Because everybody felt the team was going to be dismantled. And what you will see in that footage is my dedication to the game of basketball. Unwavering dedication, day in and day out. And being the leader of the team, I hold everyone else accountable for the success. They’re going to get an honest understanding for what winning is about. What leadership is about. Shanken: Is the documentary finished? Shanken: Have you seen a lot of it? Jordan: Yeah, I’ve seen it. Shanken: So it’s been through an editing process. Jordan: No, it has not gone through a true editing process. My agent and my people who have been working with me, have been pushing for me to do it. I have no problems with people seeing it, as long as they understand the passion, because it’s a strong passion and it’s very raw. Shanken: I think it’s a wonderful way to go public and share with people just what you were like. Jordan: If you love something, and your agenda is to win, it’s a certain price you have to pay. Shanken: Here’s where I’m going. You, 20 years ago, represented values that you had that many athletes today don’t even understand, let alone possess. So it could be a good teaching experience for all these young athletes who think everything is owed to them. Jordan: If it’s perceived properly. This is a very critiquing period of this world. We’re going to try to make sure the intent is perceived the right way. I’m not worried about that. At the end of the day my heart, my soul, my dedication is in the right place. Shanken: You are recognized in the business press—I hate to even use the word, I apologize for using the word—as a billionaire. Jordan: Me? Hmm. What does that mean? Shanken: What does it mean? Shanken: If your dad were alive he’d be so proud of you. Jordan: What would my father do right now? First of all he’d probably be sitting here smoking a cigar. The thing I remember the most about my father—and I had him for 32 years—I never look at it from a negative sense. Obviously he was murdered and rarely do I get the chance to talk about him. I think about him practically every day. For a person like myself who lives in the spotlight, the thing that he’s always said is take a pause before you make a decision, and say “what if.” Whatever decision you’re going to make will have consequences. Pros and cons. That’s what my father and my mother instilled in me. Take a negative and turn it into a positive. Don’t be afraid to fail. Shanken: You obviously listened to your father, because in the very beginning you spoke about being humble, not shouting about who you are and what you’ve done and just being within yourself. A lot of kids growing up because of their parents may start that way, but not end up that way. You ended up that way. Jordan: It’s not just because of my father. My mother calls me practically every day, reiterating “keep your nose clean.” That’s her constant reminder that people are watching, people are learning, people are paying attention. The news that sells today is negative news. Shanken: That’s all the reporters want. Jordan: Not that I live in a box, where I’m afraid to do things. Some people may view some of my decisions to be not the right ones. Everybody says it was a failed opportunity for me to play baseball. For me it was the best thing to happen to me, because it allowed me to go back to the game [of basketball] with a stronger passion. At the same time I was able to understand the love that these minor league baseball players have making $1,500 a month. That helped me put things in perspective. When I went back to [basketball] I appreciated it even more. So when we won those championships [in 1996, 1997 and 1998] those things mattered to me far more than what I did in ’91, ’92 and ’93. People don’t see that. All they think about is he batted .202, and he struck out a certain number of times. Yeah, OK. But the effort was there and the learning curve and the passion was there. That’s what my father and my mother instilled in me. Take a negative and turn it into a positive. Don’t be afraid to fail. Shanken: Other than playing golf with me again, and going to Cuba, what’s on your bucket list? Jordan: Winning a championship in Charlotte. Jordan: That, to me, is huge. I think the city deserves it. It’s gone through a lot. Me personally, like any father I just want to see my kids successful. I’ve gone through so many good things, there’s been very few bad things, but bad things make you better. Shanken: Why do you do so few interviews, hardly any, and why have you agreed to give us a second one? Jordan: Part of the reason I kind of toned back is I want my life to be my life. I don’t want to sit here and constantly reiterate things that I’ve said a countless number of times. At the end of the day, my time in the spotlight is dwindling. And I want to be able to control what I do and what I don’t want to do. Someone else needs to step into the limelight. Me, I don’t need more admiration. I’ve had enough. It’s been great. I’m still going to be a very positive force within the community, with the kids of tomorrow, but I’ve got my own kids. I have my own wife. I’m 54 years old. I want to be able to go through a week not worrying about what I have to do on Wednesday, and what I have to do on Thursday. And sometimes I surprise myself because I find I’ve got nothing to do today. Or I have nothing to do tomorrow. That’s, to me, ultimately retirement. Shanken: At my age I probably work too hard. So all I can say to you is: I want to be like Mike.